It feels like the whole world is holding its breath for the Apple tablet. But maybe we’ve all been dreaming about the wrong device, Gizmodo reports. 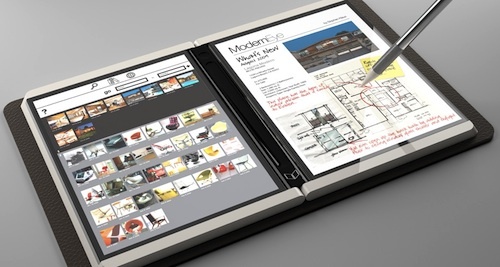 This is Courier, Microsoft’s astonishing take on the tablet. Courier is a real device, and we’ve heard that it’s in the “late prototype” stage of development. It’s not a tablet, it’s a booklet. The dual 7-inch (or so) screens are multi-touch, and designed for writing, flicking and drawing with a stylus, in addition to fingers. They’re connected by a hinge that holds a single iPhone-esque home button. Statuses, like wireless signal and battery life, are displayed along the rim of one of the screens. On the back cover is a camera, and it might charge through an inductive pad, like the Palm Touchstone charging dock for Pre. Next Article Broadband price war on the cards? Assange: who should own the Internet?